party favors – Stones, and Tokens, and Hearts, Oh My! Are you just getting started on your holiday shopping? No problem! Order up until December 17th and we can get your order to you by Christmas. (There are a few exceptions to this – please be sure to read each item description carefully as certain items have longer than usual handling times.) And remember…simple and tasteful gifts pack a big punch! Keep it Simple Ceramic word stones are just $1.95/each. Eeek! We are so excited! 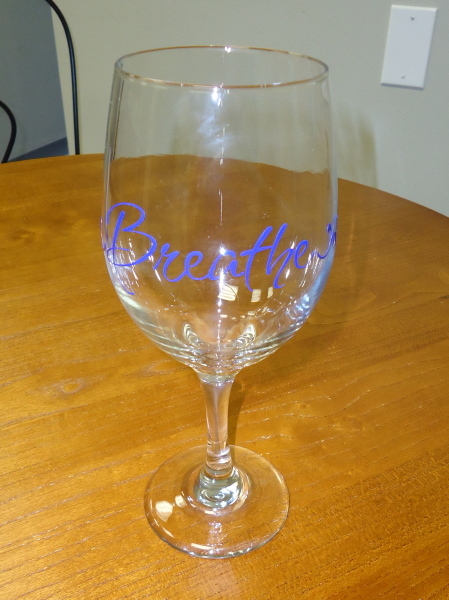 Our custom imprinted glass stones got a face lift! We are now offering multi-colored ink printing! We can now print your logo or artwork just as it is, in multiple colors. The results are beautiful. And, as always, we still offer single color printing in our standard gold and black ink. Everything else has remained the same – the minimum is 100, and set up fees are free. Pop onto our site for more information on how to place an order! 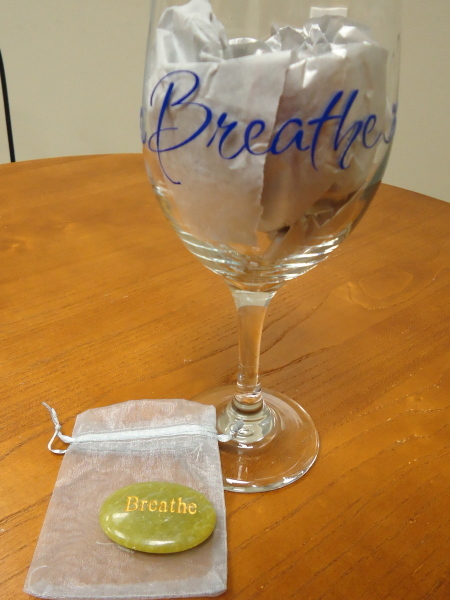 Custom stones make great giveaways for your next corporate event, unique party favors, memory stones for funerals and celebrations of life, and sweet little employee gifts. Large Quantities – No Problem! Got a big project for work? Need a giveaway for a church event? Looking for that perfect party favor? ALL of our products have generous quantity discounts…the more you buy, the more you save! Our engraved river rocks and metal pocket tokens make wonderful, inexpensive and powerful mementos for just about any occasion. We’re always happen to answer any questions. Have an idea but not sure it will work? Email us at info@courageinstone.com! Having a work, church or school event? How about something personal like a party, memorial service or wedding? Anything you might need large quantities for, we’ve got you covered! All of our products have quantity discounts, so the more you buy, the more you save. Add in free standard USA shipping and our stones and tokens make very affordable party favors and event mementos! Visit us today at http://www.CourageInStone.com! Suzi needed an amazing gift to give as favors for a bridal shower she was hosting. This is what she came up with!! Pack some punch the next time you need to make a gift for someone, these would work wonderfully for any occasion! 1. Pick some marble energy stones from CourageInStone.com – we have an amazing array of words – and don’t forget to include an organza bag. We picked words that we thought would appeal to the bride. 2. Purchase some wine glasses, these can be any plain wine glasses. We got ours at Dollar Tree for, say it with me now, ONE DOLLAR! 3. We ordered the sayings in vinyl from EADDesigns.com, but if you have a cricut you could cut them yourself. We had the vinyl cut in the same color as the bridesmaids dresses. 4. You’ll also need some tissue paper and curly ribbon in a complementary color, we chose silver to go with the shoe color of the bridesmaids. Get Started: This is really so easy! 1. Rub the vinyl on your clean, dry wine glass, make sure to line it up well before you adhere it. 2. 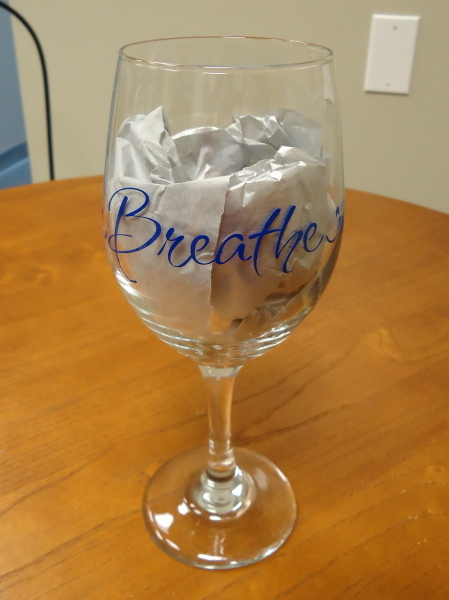 Add tissue paper in glass. 3. 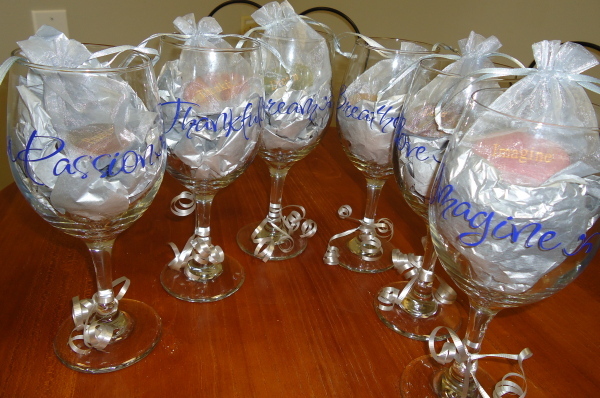 Put Marble Stone in Organza bag and place on top of tissue inside glass. 4. Add curling ribbon to bottom of glass. That’s it!! You’re done!! 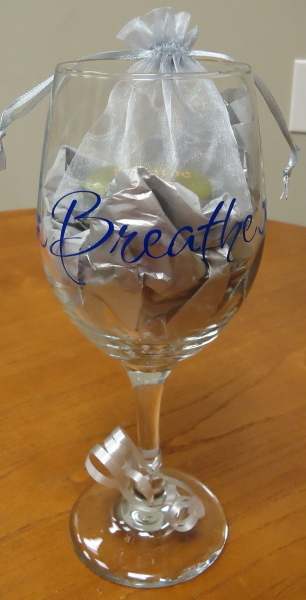 The result is a beautiful gift for a party favor, dinner party or any occasion!! P.S. from Suzi: We had fun creating these simple but elegant favors in the office. They were a huge hit at the bridal shower that I helped host Saturday evening! Cheers!